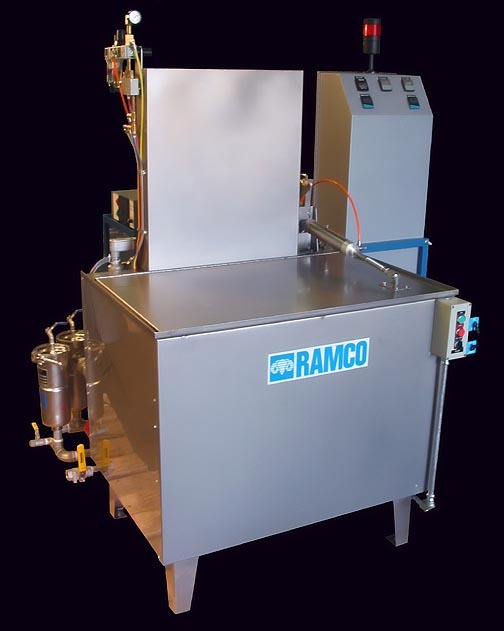 RAMCO MKD16 is a Multi Stage Wash/Rinse Console for degreasing and cleaning applications. The MKD16 is a Multi Stage Wash/Rinse Console designed for a multitude of degreasing and cleaning applications. It is an ideal cell washer for in-process cleaning. Its broad range of optional features also allow it to be used for precision and final clean applications. The above photo shows an MKD16 using turbulation, agitation and ultrasonics for the process. The wash chamber includes ultrasonic and agitation/turbulation modes with MultipleRollover sequencing. The rinse chamber includes agitation. The Nema 12 operators control panel includes digital cycle timers and temperature controllers. The ultrasonic generator is positioned on a pedestal adjacent to the wash/rinse unit. Each stage is electrically heated. Fill out this form to contact our network of specialists to discuss your needs, ask questions, or get a quote. 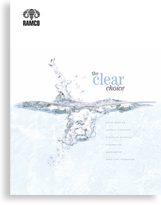 RAMCO Equipment Corporation is a third generation privately owned and operated company over 85 years in business offering a complete line of cleaning and degreasing systems. © 2018 Ramco Equipment Corporation. All rights reserved.